The Starbucks everyday coffee is called “Pike Place Roast.” This entire blog post is nothing but a lesson on the correct name of the current Starbucks everyday brew. It is not called “Pike’s“. It is not called “Pike’s Peak“. It is not called “Pike’s Blend“. This coffee is called “Pike Place Roast”. The label on the bag says what it is. Starbucks doesn’t sell “Gold’s Coast” or “Verona’s” either. As I visit Starbucks, I frequently encounter stores with chalk signage that says “Pike’s“. This is wrong. Baristas often incorrectly call it “Pike’s“. Many customers often make the same mistake. The coffee takes its name from the Pike Place Market. It is not called “Pike’s Market”. When in doubt about what this coffee is called, look at the bag. For the visual learners who are reading this blog, just look at the coffee stamp image associated with this blog post. For the auditory learners who are reading this, I’ve included a little snippet of Cliff Burrows, President of all U. S. Starbucks, talking about this coffee. For the auditory learners reading this blog, you can click the replay button and listen over and over again to Cliff correctly call the coffee “Pike Place Roast“. Cliff has got it right. Thank you Cliff for helping out the StarbucksMelody.com blog. *Edit: Previously I had called it a “British” accent but I’ve been corrected by a twitter follower that it is actually a Welsh accent. I didn’t know that. Sorry! I didn’t mean to mess that up! When I saw this post come into view in my Google Reader, I couldn’t help but laugh in agreement. 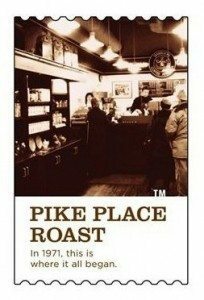 I too, get irked when people pronounce it as “Pike’s Place.” Why add an unnecessary ‘s’ to a coffee’s name? Interesting post. Melody why do you think there is such confusion over the name? And the funny thing is that my interaction with people at my local SB tells me that this coffee is still not as popular as the bold choice of the day. Had to laugh! I thought I was the only person bugged by stuff like that! Glad I’m in good company! why oh why i wonder! You can have as many tutorials about the proper pronunciation as you like; people will still call it “Pike’s Peak” because they are stupid. I’m reminded of Meatwad from Aqua Teen Hunger Force, who does the same kind of thing. It’s fitting, too, since most of these folks display about the same level of intelligence as Meatwad. I don’t know where adding the s comes from, but I hear it a lot. Like Kroger’s, Aldi’s, Meijer’s, etc. None of these have an s on the end, but they all get it added on. Annoying, but sadly, I’ve come to accept it. My guess is that it’s caused by confusion over “Pike’s Peak” and the “Pike Place Market.” My assumption would be that most have experienced neither so they see the names as one or related. I write on all the tags for Pike Place Roast, yes Pike Place Roast not Pike, not Pike Place, Pike Place Roast. Before right pronunciation, Starbucks Coffee Japan don’t have them. Baroosta, lemme guess: you’re down South too? Sounds like the Carolina / Georgia drawl we have here. Y’know, I can excuse a lot of these for first-time customers, who come in and see these weird Italian names. “Lemme try a…how do you say that? A m…mac…mockacheeto?” But when they’re a regular who has the drink repeated back to them correctly each time, you’d think they’d learn the proper pronunciation. The conversation in here is great. CD, I love the “I’ll just say ‘no thanks'””. I admit I initially had difficulty with it simply because “Pikes Peak” is a place I visited in my childhood. Now it’s easy “Pike Place”. Haha AmazonV! Love it!! Yes, that is exactly what you are supposed to ask! sorry, off topic but: sat. 8/14, 8:30A cst: is anyone else finding ‘msi’ down??? or can’t get in?? just wondering. @DeniseR – Late last night I’d tried to get into MSI and so the same error. Yep, MSI is down still.Btw, do you realize that the moderator sbx_jcar is gone? Makes me very sad. He left Starbucks after a long history with them…years and years. Also am off topic but I too cannot get onto MSI August 14 at 10 am est. I have to say that your blog Melody far outweighs MSI so I am totally not upset that they are having problems. They need to update their site. It’s 4P cst (sat.) and msi is still down. I did receive a note from Cecile they are working on it. ??? Melody: surprised about Jeff. Is your computer ‘fine’ yet? I use the pronunciation of “Pike Place Market,” and thus, “Pike Place Roast,” as a barometer to tell how long someone has lived in Seattle. Tourists and newer transplants will invariably refer to the market as “Pike’s,” implying that it belongs to some man or fish. No. Nope. The street name. The street is Pike Place. Sadly, many of my fellow partners at 1st and Pike still refer to it as “Pike Place Street” when attempting to direct a hapless tourist to the first store. I chuckle and quietly correct them, then listen as they continue to make the same mistake with each subsequent customer. I’ve given up all hope of setting them straight.